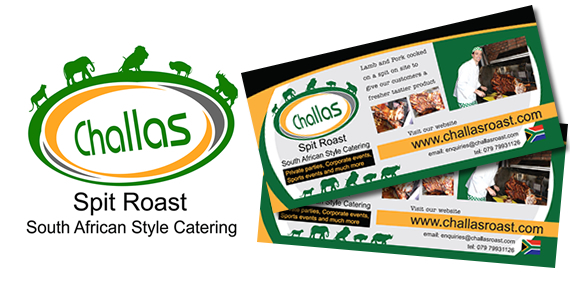 Chew Design recently completed work on graphics for Challas Spit and Hog Roast. 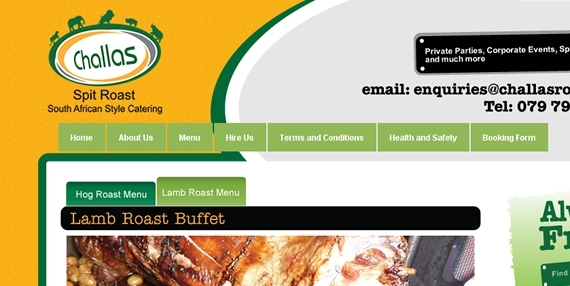 It’s a Hog Roast Catering Company providing event and outdoor catering in Dublin and Belfast. They required design work from the ground up, everything from logo and company graphics right up to fully functional website. Challas were clear right from the start that any design solution should strongly suggest a deep connection to South Africa. The director of Challas himself, Charl Marais is South African and he has set his catering company up on the assumption that people in this wee country of ours might just appreciate a little bit of South African styled cuisine. The logo was a good place to start. It features golds and deep greens as well as imagery of animals native to the region. Its a strong identity infused with notions of a traditional view of Africa and a hint of modernity in the font choice. Such a strong concept was easily brought forward to further design requirements for this company. Stationary, leaflets, banners for the market stall and menu boards all benifited from a grounded strong identity agreed and developed at the start of the project. The website carries the Challas Spit and Hog roast brand with an air of playfulness. This is a catering company which aims to target events such as event catering, private parties, weddings, corporate and sports and outdoor events throughout Dublin and Belfast. The website had to look fun and user friendly yet ultimately professional at the same time. Layout was the key. We kept things simple. The end result is a website which is effective and definately user friendly. Visit www.challasroast.com – Hog Roast Dublin – Hog Roast Belfast for a peek at the end result.